The menu shouts, "Show me the money"
Chef Alain Ducasse is one of the most awarded chefs in the world with a collection of 18 Michelin stars across his many restaurants. 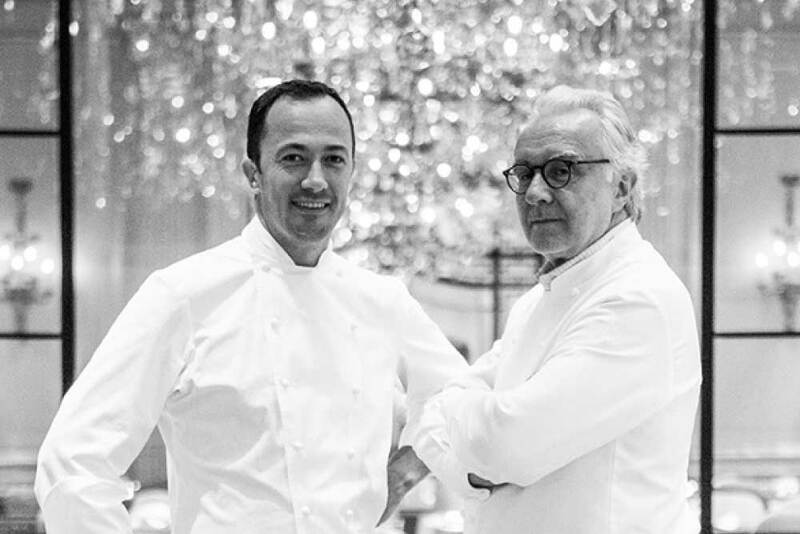 Today we are visiting his three Michelin star restaurant in Paris – Alain Ducasse au Plaza Athénée – No.21 on the The Worlds 50 Best Restaurants list for 2018 and No.66 – Opinionated About Dining Top 100+ European Classical Restaurants 2018. 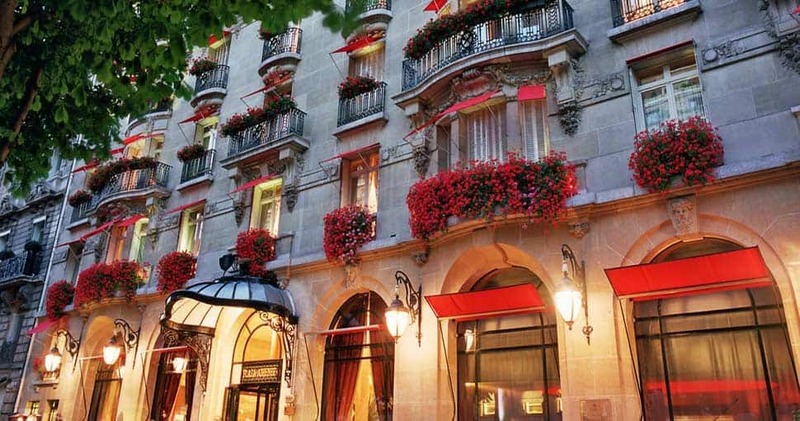 The Hotel Plaza Athénée is a luxurious restaurant/hotel establishment on Avenue Montaigne in Paris where Alain has selected Romain Meder as his executive chef. Avenue Montaigne is considered to be the grande dame of French streets. 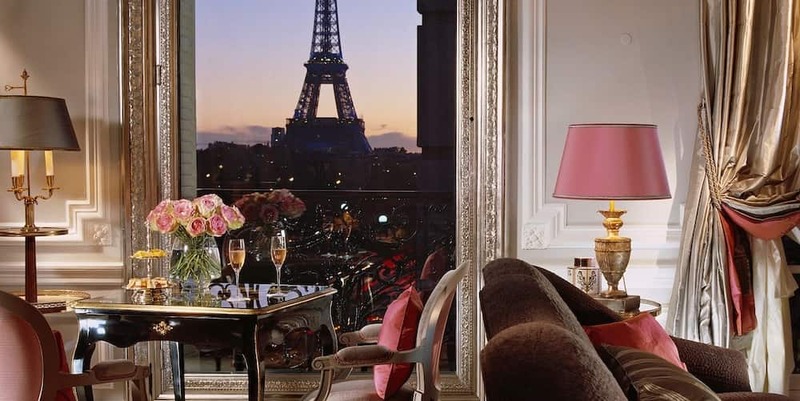 Home to the creme de la creme of high fashion: Dior, Chanel, Valentine, Ralph Lauren, Louis Vuitton and Bulgari to name a few. Plaza Athénée Paris drips with luxury and Alain Ducasse’s restaurant is the jewel in the crown. As we enter the hotel foyer, the opulent dining room beckons. Just to see the room is an experience unlike any other. I am in awe as we prepare to step into this fantasy land. 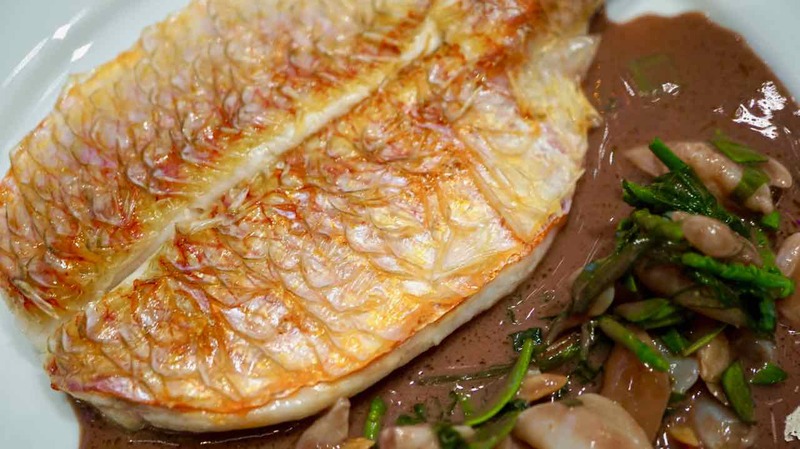 Chef Alain Ducasse has a reputation for perfectionism that extends to more than his food. 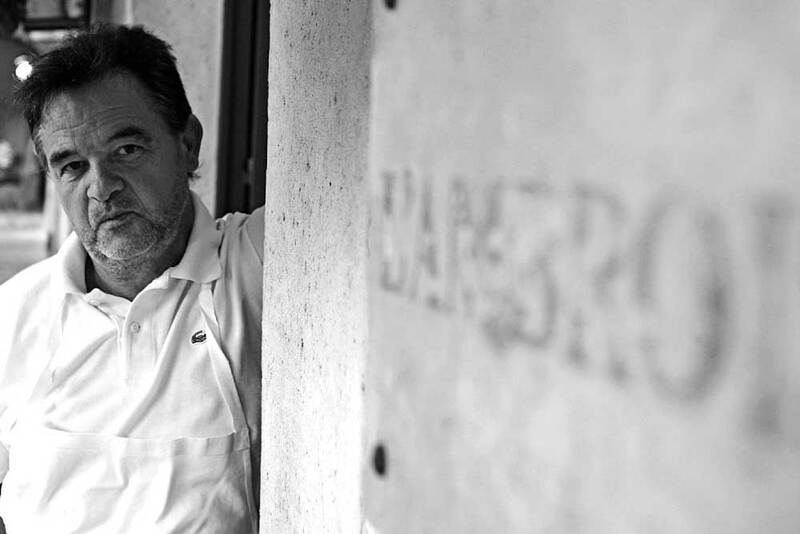 He expanded his mind to the consideration of every detail of the dining experience when in 1984 he found himself bedridden for months, recovering from a fatal plane crash where he was the only survivor. While his devastated body healed, his mind wandered with imaginings of how he could still be a chef without entering the kitchen. He has been personally involved in every design choice in this room and the selection and placement of each object in it. Designer Patrick Jouin and architect Sanlitun Manku have brought their skills and passion together to form the Jouin Manku Tandam agency. Their unique style brings an uber modern, industrial, practical yet beautiful flavour to the projects they collaborate on. 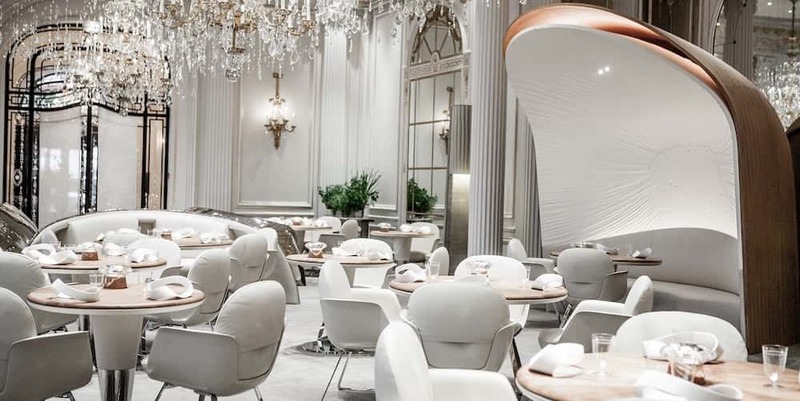 They have worked with Alain Ducasse on his restaurant interiors and here at Plaza Athénée Paris it feels like they had free reign with no expense spared. The scale tricks employed in the features of the room, give away clues to Jouin’s early training under the art direction of Philippe Starck. Huge silver curved seats reminiscent of silver cloches dramatically anchor the room. The sleek curves and shiny mirror finish, reflecting the sparkles from the spectacular crystal teardrops that fall down like summer rain from the lofty ceilings. It is a breathtaking fairy land and its all I can do to not stretch my arms out and spin under the magical chandelier. Feigning elegant restraint and sophisticated assuredness I lift my chin and glide along as we are escorted to our pretty table. As we are a table for two we don’t qualify for sitting in a silver cloche but our simple blond timber table is a gorgeous piece of design in itself. Designer Patrick Jouin’s One Shot stool is a crazy little thing that I am absolutely fascinated by! As we are being seated, its slender form reminiscent of a folded umbrella (without the handle) is placed next to me and with a flick of the wrist its centre mechanism is released and its twelve slender legs twist around as it sinks down and spreads itself out to form an elegant stool for my handbag. Ooh I want one!!! The room begins to fill up with the beautiful people. I notice there seems to be several ladies that have come to lunch with their elderly fathers. They seem to be experiencing a shortage of fabric with thinly stretched outfits struggling to accomodate their unnaturally ample bust lines and riding up their long skinny legs. And oddly their swollen lips seem to interfere with their ability to sip champagne. Many of the women here are also sparkling as much as the chandelier. We ask to speak to the Sommelier. Laurent Roucayrol, head sommelier of the restaurant arrives and he is a serious chap, clearly confident and very professional in his approach. He asks if we have decided on our courses, which we hadn’t. He immediately excused himself saying he will return when we have decided – how can he possibly recommend wine pairing when we have not yet decided on the food. Then whoosh he was gone! Oh ok then, best we focus on the menu! With some guidance from our lovely waitress Naïri, we decided on three different courses each with a promise to share tastes. Our selections focused on the seafood. Ok now where has Laurent gotten to – we are excited to talk wine! Laurent returns and seems to approve of our menu choices and after a brief chat about our preferences he has just the thing. Bringing us a 2013 Riesling from the Burgreben vineyard of Domaine Bott-Geyl. This juicy little Alcace Riesling is gorgeous, it has personality and the kind of crisp acidity I love. As the Amuse bouches begin we soon understand how clever Monsieur Roucayrol has been in his selection! 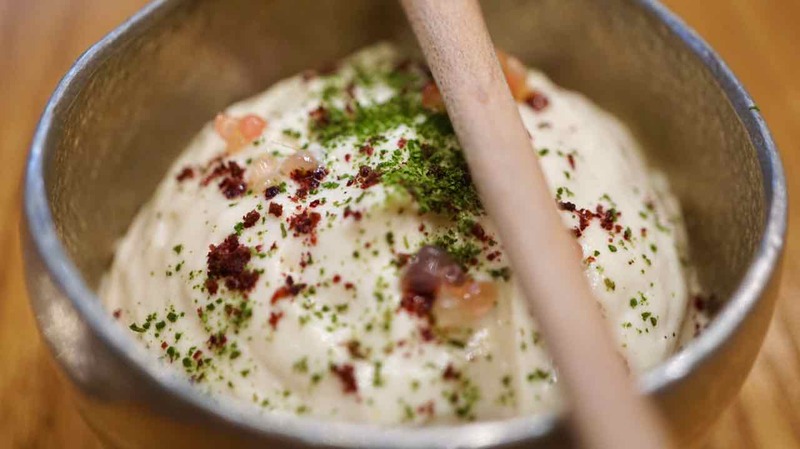 Little tastes are brought to whet our appetite, starting with a delicious little condiment made from radishes from Versailles topped with zingy refreshing pomegranate. 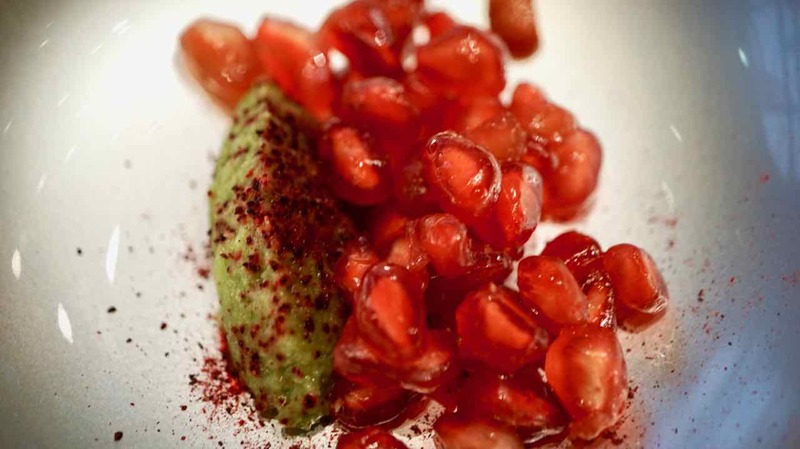 A lovely combination of a little heat from the radish balanced by the cool and the crunch of the pomegranate. 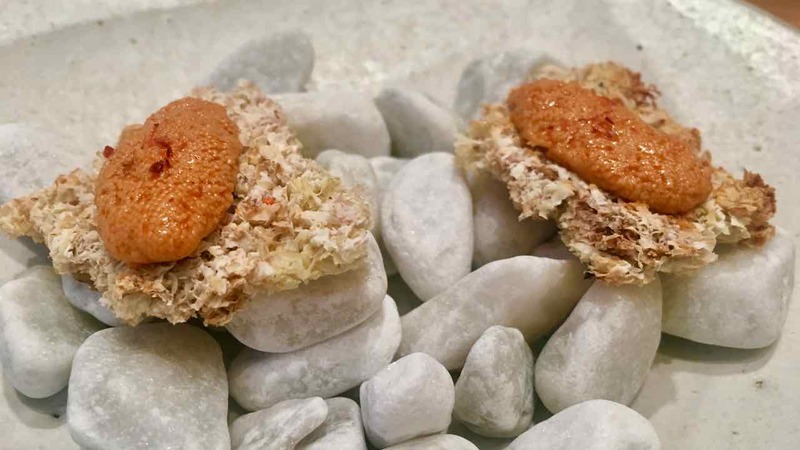 Then a little plate with white stones topped with two small bites of crispy airy toast topped with little monkfish livers. An interesting richly flavoured dish, yum! 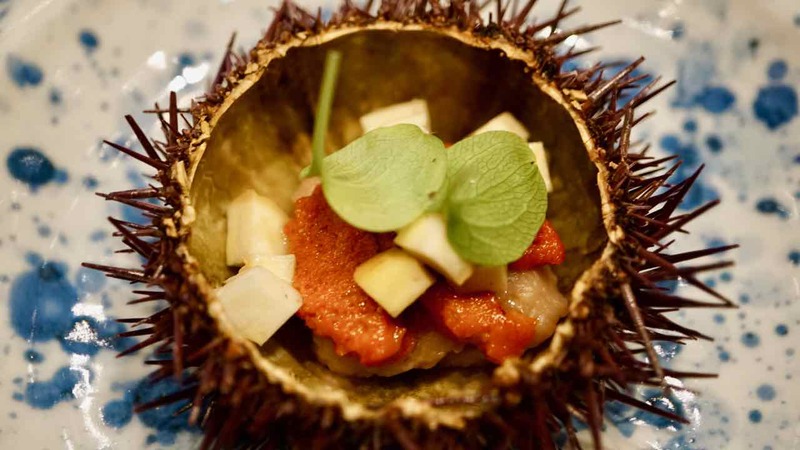 Next is a generous serving of sea urchin, presented simply in its spiny shell. The urchin is resting on a creamy chestnut puree with crisp chestnut pieces on top and seasoned with a little bright green peppery leaf. A little wooden spoon and a small hand beaten silver bowl containing our next amuse bouche. Chick pea mousse and sea bass tartare. 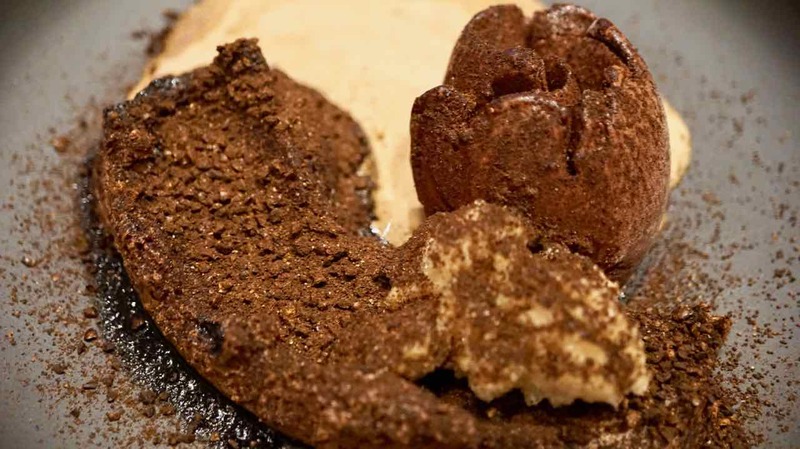 The mousse is beautifully light and airy, the bass firm and sweet, a lovely combination. Moving now to the first of our three course menu, entree. After much deliberation and conversation with Naïri we opted for the two most special dishes on the menu, langoustine and lentils with smoked eel jelly and caviar. I have definitely got the pick of the entrees. A neat circle, made up of smaller circles of thickly sliced Langoustine richly iced like a cake with caviar, is placed before me. 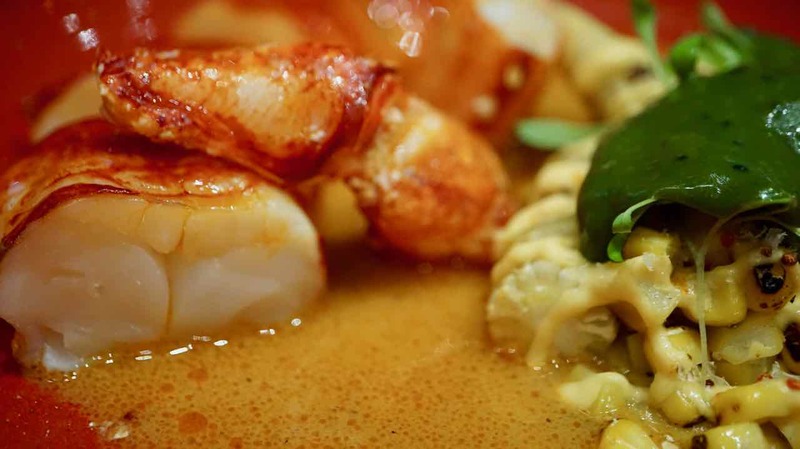 The langoustine is delicious, it has been served with a small pot of broth on the side, fragrant with lemongrass and ginger it is the best element of the dish. It is a large portion and I have never seen so much caviar. Or so I thought until my love’s lentil dish arrived. 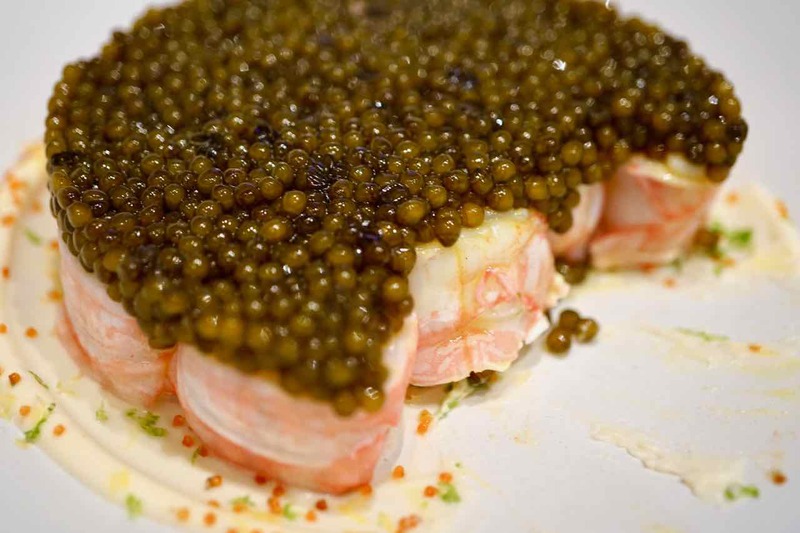 He had been expecting a lentil dish celebrating Alain Ducasse’s passion for vegetables, accented with caviar. 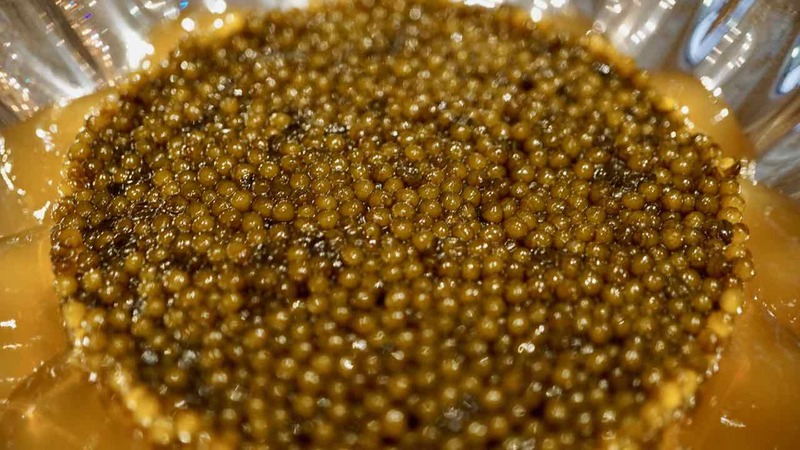 In reality it is a gluttonous bowl of caviar, with a touch of lentil and edged in a jellied smoked eel stock. If that isn’t decadent enough, it comes with a big pot of thick rich cream. The first two or three spoonfuls were nice but that would have been enough. It got tired very quickly, by spoon seven my love was exhausted, spoon twenty seven was just not a possibility. Gagging with caviar overdose, fishy, salty and more fishy drying out our tongues, we were momentarily excited when Naïri brought a surprise dish – a special dish from the chef, what a lovely gesture. And then she placed it down. Oh god more caviar! Caviar with white beans. We smiled and thanked her. As she walked away we slowly turned to each other and without any words we both felt the ‘oh dear’ moment. We tasted it and it was nice. For me the peppery white beans were the best bit. But the caviar, the caviar is just about excess and extravagance and I simply can’t make make sense of it from a flavour perspective. I’m pretty sure after today I can tick the caviar box and move on with my life. Relief came in the form of Laurent who arrived with a change of pace in the wine department. We had challenged him with the concept of a red wine that works with seafood, a red wine with the personality of a Chardonnay? He nonchalantly presented us with a 2013 Aloxe-Corton 1er Cru from Domaine Captain Gagnerot. Well of course, it’s gorgeous, a happy highlight to the day. Fruity elegant Pinot noir that is bright enough to compliment seafood but equally I still could imagine it washing down a good steak. Our main courses arrive and it is another case of having gotten it half right. I had opted for the lobster and my love baby red snapper. The baby red snapper was a pretty plate, the fish half butterflied, the front spread out either side of the little intact upright tail. 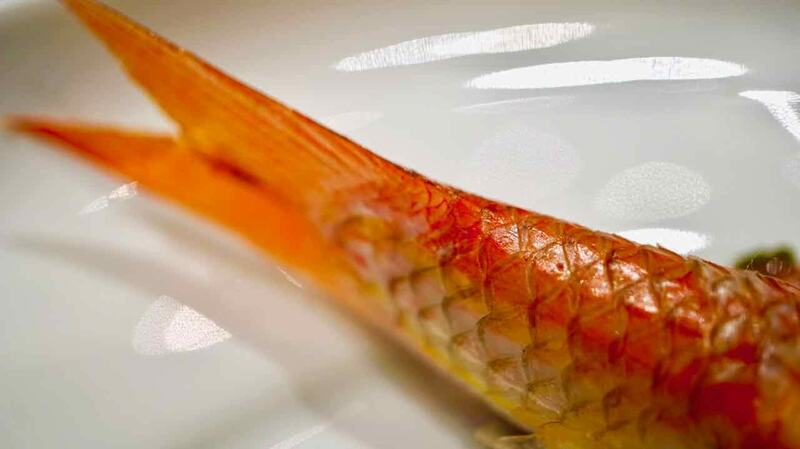 It looks pretty on the plate, I like the little red tail and the structured pattern of the scales. The fish has been cooked on the scales so they are all standing up a little, golden red and crispy. Served with Cockles and a lovely little red wine and fish liver sauce. Nice but nothing really outstanding or creative about it. Cotentin lobster, eggs emulsified with chilli, corn-in-milk. The lobster came served on a rich orange red plate that mirrored the gorgeous flecks of colour on the outside of the lobster meat and against which the delicate, slightly translucent white centre of the lobster meat pops! It was dressed with a flavoursome chilli sauce made with lobster eggs. Accompanied by a generous spoonful smoked barbecued corn kernels in a creamy sauce. The lobster was lovely, nicely cooked and plentiful. In between main course and dessert Naïri brought us a little degustation of cheese. Two cow cheeses, a Stilton and a Comte, yum! Chocolate from the Alain Ducasse factory, toasted barley and malt whiskey chocolate sorbet. Dessert is the final course and we are excited. A matt black plate featuring a divine chocolate mousse, an incredible smoky single malt whisky sorbet and sprinkled with crunchy toasted barley. A fun and delicious dish. We also have “chocolate” from the Alain Ducasse factory. What looks like a block of chocolate served with a fantastic little silver knife to break it up. Visually it reminds me of my famous block of chocolate, a birthday cake I have made on many occasions. My one however has the chocolate block wrapper and the foil peeled back to replicate a real block of chocolate. Alain Ducasse’s version of my special treat is pretty amazing. Rich, delicious salty, peanutty, chocolate how could you possibly go wrong. Just when when we thought the meal had come to an elegant end, Naïri arrived with traditional Savarin cake served with an extravagant quantity of rich golden vanilla cream. It is one of those things that I politely declined on several occasions, just that bit too much after a full meal. Today we weren’t given an option – it just appeared. So I thought I might as well try it. It was a surprisingly light and delicious cake, moist and not too sweet. The cream was divine. I couldn’t possibly eat it all but I was happy to have tried this traditional dessert. Today has definitely been lunch how the other half do it! Alain Ducasse au Plaza Athénée Paris is in a beautiful room opulently designed with over exaggerated features glittering with jewels and complete with matching guests. The menu, with assured cooking and a reliance on luxe ingredients, shouts “show me the money”. Lobster, langoustine and obscene quantities of caviar washed down with champagne are what its all about. To sit under the raindrop Chrystal chandelier is breathtaking, but the cooking has not taken my breath away.